216 pages. Ebook also available. 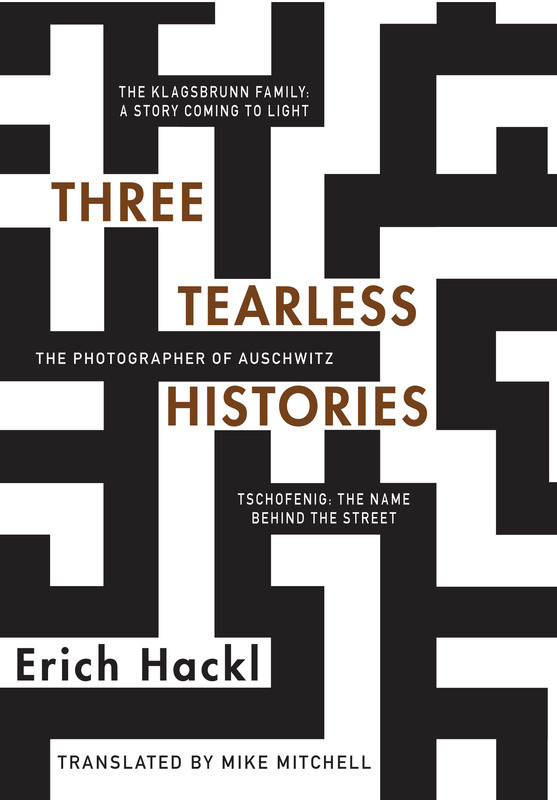 A master of German non-fiction and literature, and recognized advocate of human rights, Erich Hackl humanizes tragedies of epic proportions in three stirring and poignant stories of individuals affected by mid-century fascism. Inspired by photographs, and with the aid of descendants and witnesses, Erich Hackl brings to light three evocative personal histories, widening the frame and setting the stillness of history back in motion. What happens to the second and third generation descendants of war refugees who relocate to other countries where there is increasing turmoil? Whose eye was behind the camera during the most infamous documentations of twentieth century genocide, and what traceable effects did the Holocaust have on the photographer? What can be learned from an inconspicuous street sign in Linz bearing the name of Austrian resistance fighter Gisela Tschofenig? “The Klagsbrunn Family: A Story Coming to Light” traces the multi-generational story of emigrants from Vienna to Brazil, where their grandson and his wife were tortured during the dictatorship for communist activities and fled to Chile, Argentina, Italy — and then, ironically, a now-welcoming Berlin. “The Photographer of Auschwitz” is a biographical sketch of Wilhelm Brasse (1917–2012), a Polish political prisoner who photographed Auschwitz prisoners and saved evidence of Mengele’s crimes. “Tschofenig: The Name Behind the Street” recounts an improbable wedding at Dachau and attempts to resurrect a resistance fighter’s accomplishments amidst a family squabble that threatens to bury her forever. The clash of fascism and communism on two continents over half a century, as traced through a few family photographs. … Hackl is like an investigating detective pursuing a case where all the principals are long dead and the few who remain may be reluctant to talk. … These powerful inquiries spurred by photos are history made flesh, the untold lives of the mostly forgotten. Hackl’s use of emotional triggers related to injustice and redemption are both subtle and commanding. In the same way that we relate to injustice of the oppressed, this author delivers stunning situations in which innocent families and characters are destroyed by an unjust rule of law. Yet the ultimate value of a book like this lies in the author’s delivery of life between the lines, beyond the vagaries of a reader’s sentient ability to comprehend. Here, Hackl elicits his best and most enduring success. Highly recommended … a haunting book. Hackl’s narrative is masterful and compelling. Erich Hackl’s concise and hauntingly dense works of prose have gained him a huge audience and great success. At the bottom of his efforts are usually some forgotten beings, victims of our century’s cruel history, with their authentic albeit not exactly remembered biographies. Here Hackl, the Austrian author, overly sensitized perhaps because of his own country’s extreme insensitivities, steps in and tries to bring about an act of belated justice and redemption. This obviates the question whether Hackl is a fiction writer or a historian, a defendant of the ‘small people’ or a missionary voice of human dignity: he is all of these. Published with support from the Bundeskanzleramt Österreich. The original German text was published by Diogenes Verlag. Erich Hackl is an award-winning Austrian author and translator. He has been a regular contributor to the Wiener Tagebuch, editor of the Aurora-Library, a book series of international poetry, and he is a regular contributor to the Wochen Zeitung in Zürich. He has published numerous Hispanic literature anthologies, and is recipient of over a dozen literature and translation prizes, including the Premio Hidalgo, the Solothurner Literaturpreis, the Literature Prize of the City of Vienna, and the Austrian Prize for Literary Translation. Two of his books have been adapted to film and his work has been published in 26 languages. A masterful and authoritative chronicler. The name Erich Hackl has become a trademark for wonderfully sensitive real-life stories, unique in contemporary German literature. A compulsive researcher on the border between literature and literary-historical reportage. Mike Mitchell is an award-winning translator of French and German. He is the recipient of the Schlegel-Tieck Prize for translations of German works published in Britain and has won the British Comparative Literature Association translation competition twice for translations from German. He has been shortlisted for many awards including the Weidenfeld prize, the Aristeion prize, and the Kurt Wolff prize. In 2012, the Austrian Ministry of Education, Art and Culture, awarded him a lifetime achievement award as a translator of literary works.